Will the economy recover? This is something that analyst and retail investors alike have been specualting. There has been much discussions on the ending of QE in the US and this means that the low interest rate environment will end soon. It also means that the US federal reserve is predicting that the global economy will recover and QE is no longer needed. To know more about QE, read my previous post: Quantitative Easing - how it affects the economy and the stock market? Whether the stock market continues to rise or fall will depend on the economy. If the economy recovers, companies will have higher profits and higher profits most of the time lead to higher stock prices. Investors who bought in early expecting a recovery are still waiting for that day to come. The Stock market has been rather flat this year after the correction in June which wiped out most of the gains in the first few months of 2013. REITS which had generated rather high yields for investors over the past 2 years had either declined or remained stagnant at the top with limited upside. Some investors have sold off reits to profit on the returns. Read: why reits are on a downward fall again? I'm also betting on an economic recovery. I'm slowly buying into cyclical stocks like shipping and looking at construction companies. Food industries are on my list of investments too which I favour more on companies owning restaurants. What if I'm wrong and the economy doesn't recover? I think it will be even better if stocks fall lower so I can buy them at an even lower value. I do not have all my money in the stock market now. Still have another tranche ready to deploy if circumstances changes. P.S: My blog has achieved slightly more than 10000 page views since i started actively blogging 1.5 months ago in June. Thank you to all my readers for your support and comments. It has been a great journey thus far. Do let me know if there's anything I can improve on my blog. The current interest rate is so low in Singapore. Currently, most banks pay 0.05% on bank deposit accounts. You've heard it! Its a tiny 0.05%. That means if you save $100000 in the bank, the interest you receive at the end of the year is only $50!! What can $50 buy you in Singapore? The most a decent family meal and that's it. Why is the interest rate so low now? I've found out a very interesting history of the savings deposit rates offered by POSB which was known as Post Office Savings Bank in the past. The highest interest ever recorded was 9.5% on 1 August, 1981. I am not old enough to have experienced the history of interest rates in Singapore so i asked my parents and also searched on it in the internet. My parents told me in those days, they had an average of 5-6% interest from the savings they put in the bank. Every year, they had hundreds or thousands of dollars in interest from the banks. My mum even said my grandpa always used the interest earned from savings in the bank to give red packets to us. We had very generous red packets from my grandpa on every Chinese new year at that time. That was in the late 1980s and early 1990s. What happened to those days where we see high savings account interest in Singapore? We can see that interest rates has fallen over the years. Let's look at the history of interest rates in Singapore learning from POSB. 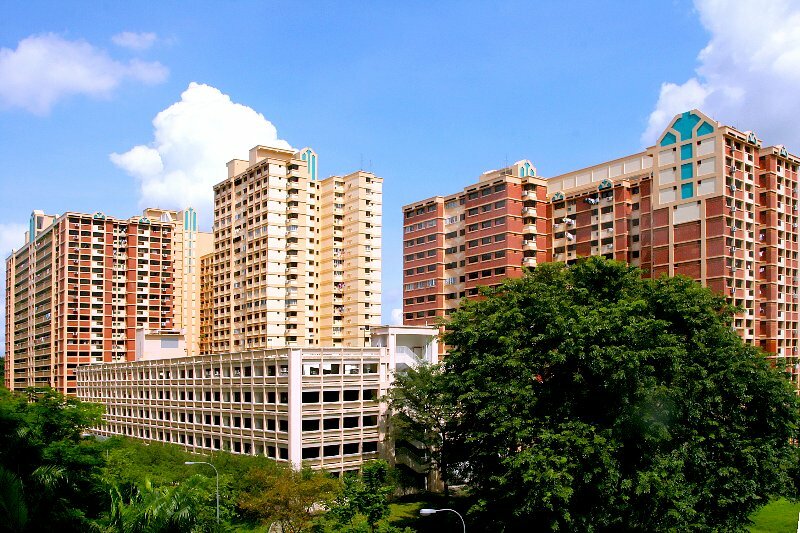 In 1974, POSB was transferred to become part of the Ministry of Finance and Credit POSB Pte Ltd was established in the same year to provide custom-tailored loans relating to HDB housing ownership. POSB also raise the interest rate to 4.5% p.a. for deposit on 1st Jan, 5% in July and 8% in August. 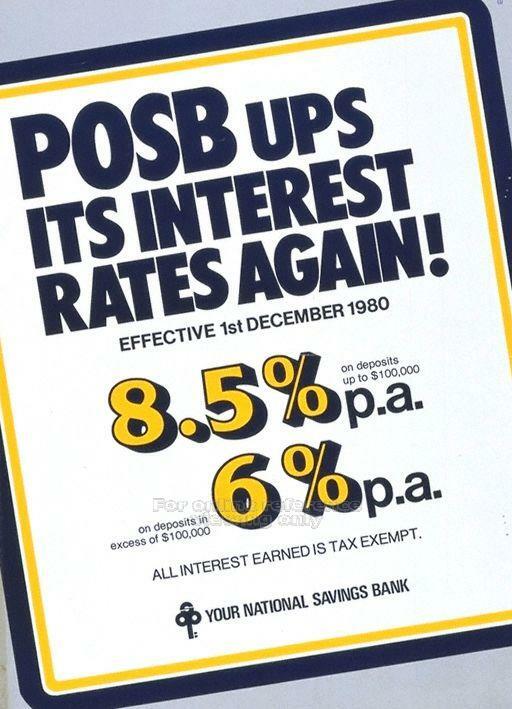 On 1 September 1978, POSB introduced a 2-tier interest rate with a 5.25% p.a. for the first $100,000 deposit and 3.5% for the subsequent amount. In 1980, it introduced the Passcard, and set-up the Principal Branch. On 1 May 1980, POSB revised the 2-tier interest rate upwards with a 7% p.a. for the first $100,000 deposit and 5% for the subsequent amount. In 1981, its first Cash-On-Line ATM opened at the Newton Branch. On 1 July 1981, POSB revised the 2-tier interest rate upwards with a 9% p.a. for the first $100,000 deposit and 6.5% for the subsequent amount. I remembered my dad had a very old POSB cash-on-line atm card but i just couldn't find any pictures on it. It was grey in colour and had a card holder also. Maybe some of you would remember that. On 1 Auguest 1981, the interest rates on the first $100,000 was revised upwards to 9.5%. This was a historical moment as it was the highest interest rate every recorded. The Post Office Savings Bank (POSB) was officially renamed as POSBank in March 1990. The word “Savings Bank” was dropped. On 1 June 1990, POSB adjusted the 2-tier interest rate upwards with a 4% p.a. for the first $100,000 deposit and 3% for the subsequent amount. 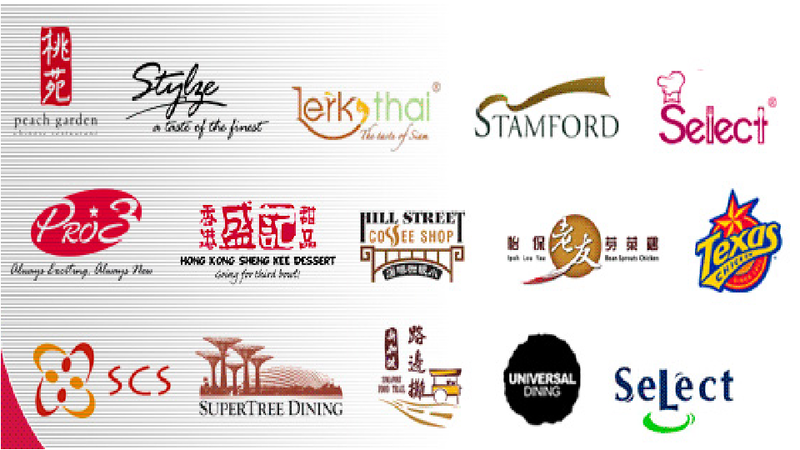 POSBank was fully acquired by DBS Bank on 16 November 1998. Witnessing the event were Finance Minister Dr. Richard Hu and DBS Bank Chairman Mr. S. Dhanabalan. This event marks the end of Savings Bank concept and welcome the new era of low interest loans in Singapore. Mr. S. Dhanabalan, the Chairman of DBS Bank, declared that “POSBank cannot remain the way it is”. To start the ball rolling down hill, DBS announced on 18 November 1998 that POSBank Savings Account Balances, which is still tax-exempted, for the first $50,000 is at 2.25% p.a. down 0.5% and in excess of $50,000 at 2.25%. And swiftly on 10 December 1998 that POSBank Savings Account Balances for the first $50,000 adjusted downward to 1.5% p.a. and deposit in excess of $50,000 at 1.75%. By year 2000, saving deposit interest rates dropped below 1% and has been even lower currently. One good thing about the low interest rates on deposits was that loans interest rates also decreased significantly. Those who buy properties could borrow at a much lower rate which is also a cause of our sky-rocket housing prices currently as loans were very affordable. At current low interest rates, our money becomes more and more worthless in the bank as inflation "eats" up a portion of our cash. Can we really feel the effects of inflation in our daily lives? If you ask the older generation, they would grumble about the higher prices today and compare the cheaper things they could buy back in the past. This is not their fault that they are complaining. They have live through the past and experienced things that we as younger people do not understand. Let's look through at how much things cost in the past as compared to today. I found some interesting pictures on the internet. Pictures taken from remembersingapore.wordpress.com. Quite an interesting blog. Bus tickets in Singapore. This one i remembered as i used to insert a transitlink card into the bus machine when i was in primary school and press a button for the correct fare and out comes a ticket like this. I guess this was much earlier than my time as its only 10cents per ticket. I remembered my student fare was 35cents at its cheapest for a non aircon bus. You should know how much prices are for public transport now. Old movie tickets at $2.50 and $3 in 1985. Now? A weekday ticket at $7.50 and weekend ticket at $10.50. That's 3 times more expensive now. HDB prices are the major increases. The current 4 room flat that i live in now cost $70,000 in the 1990s when my parents first bought it. Now it cost more than $300,000. A bowl of fish ball noodle cost $2 in the 1990s. Now average cost around $3. Will prices continue to rise? I'm sure it will unless our economy suffers a long recession and go into a deflationary mode. If this does happen, then we may lose our jobs too. We wouldn't want that to happen. The purpose of me showing you the above price increase of different items is not to complain about the high cost of living but to bring to your attention that the same amount of money we have now will not buy us the same amount of things. In the 1960s and 1970s, people who have $1000 were considered those who are more well off. $1000 could buy you a lot of things and last you for months on food. Now, $1000 is nothing in our current economy. If we think that $100,000 is a lot for us now, it may be worth not much 10 years from now. With savings interest so low now, the need to invest become increasingly importantly. Or else, we will realise that our hard earned money saved is not enough for us to retire. Learn to invest and invest wisely. Read my below posts to find out more and get started in investing. 1. Investing basics - How do I start investing? The monetary authority of Singapore(MAS) has released statistics which shows a worrying trend of household debts in Singapore. There is also a separate report released by the ASEAN property pulse which showed that up to 9000 Singapore property owners could be forced to sell their homes if interest rates rise. 3) Only 70% of the existing loans are for owner occupied homes meaning investor demand for private homes is running quite high. Once interest rates rise, some owners will have problems paying their mortgages and will have to sell their house. Coupled with the bump up of new housing units in the market expected to be completed within the next 3 years, this will cause imbalances in the economy where supply is more than demand. We should expect a correction in property prices within the next 2 years. The government has sounded warning signals over the past 1 year. MAS has stepped in to impose stricter rules on loans. All these are signs that we should take note and not ignore. 2. Quantitative Easing - how it affects the economy and the stock market? 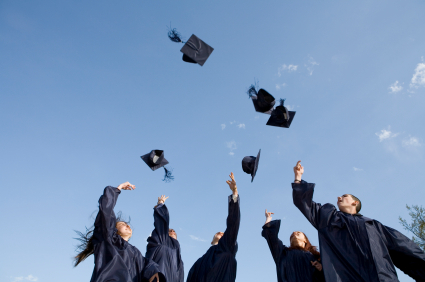 NTU graduates in demand - Finding job so easy? Read the news today and saw this news about NTU graduates in demand. 7 in 10 secured a job before graduation. It was stated some were SPOILT for choice as they had multiple jobs offer. Now the job market so good? Finding job so easy? Another thing is the top 10% of these students drew an average monthly salary of $8000. Really amazing!!! Over the years, as i learn more on how to manage my personal finances, it became more fun to me. Regular savings have become a habit and i have opened several bank accounts to allocate my money respectively. I have a spending account, an investment account, an emergency fund account and a monthly savings account. 1) Allocate around 6-9 months of my expenses into an emergency fund account. An emergency fund is important in case i need the money urgently. This is strictly for use during emergency time when i have not enough cash. 3) 15% of my monthly salary to a savings account for higher interest. This account is to earn higher interest rates than a normal savings account. There is no lock in period and i can take out my money anytime. This also serves as an opportunity fund where if a stock market crashes, i have extra money to buy undervalued stocks. I use this fund to donate to charity also. If there are leftovers in my spending account, i can accumulate to a certain amount and spend on luxuries. I pay the premiums for my insurance policies from this account also. As i have more money over the years while working, it gets more and more exciting to see my account balances grow. Saving money is part of my life now and i do not find it hard anymore. When i first started out, saving money was hard as we're more prone to spend more money. I learnt that in order to have a financially free life, one thing we must learn is to have delayed gratification. This means paying myself first by saving and then spend the rest. Living a simple life helps a lot too. I prefer life to be simple although i do spend on luxuries like eating out at restaurants or travelling. But still those luxuries can be done at low cost if planned properly. Many people spend money first and then save. This is why most people find it hard to save money as most of the time they do not have much left over after spending. It takes discipline to put aside a fixed percentage of your income for savings before you even start spending. I use a free service provided by DBS bank to auto transfer money out to my various investment and savings account once my income goes in. This saves me the hassle of transferring manually every month. I do not even have to monitor where my money goes. Everything is automatic. As my investment account grows, i can invest more easily. Investments make my account grow and there are dividends from stocks also. Money is constantly flowing into this account. I will let money in this account to compound over time and this will help me achieve financial freedom in the near future. You may be wondering why not spend some of the investment gains and dividends from stocks? I do not think i should do that as the purpose of investment is to grow the money. If i do want to spend more, then i should try and increase my income so that i have more money to spend in my spending account. If i am able to increase my income, then i don't even have to save that much anymore. Managing our personal finances is important. I set financial targets for myself to make sure i'm on track. You can read it in my goals tab. The journey towards financial freedom is a journey in itself. You have to plan the road or else you'll get lost or get off track. This road is an exciting one and i hope to update you of my progress in years to come. I have been inspired by many people who have walked this road and accomplished what they set out for. They have shown that it is possible. If more people know how to manage their personal finances, more people can benefit from a lifestyle of financial freedom. We can get out of the rat race and truly enjoy life, not just working for money for the rest of our lives. 3. Investing basics - How do I start investing? All of us have different personalities. Some like things to be fast, others like it to be slow. Some are patient while some are not. The good news is there are different investments that we can make to suit our personality. It is important to find out your investment style and practice it so that you can be successful in it. The returns in fixed deposits are generally low now due to the low interest rates environment. They are capital guaranteed and you will get your capital back with interest at the end of the fixed period. Bonds are generally safe assets where you can get your capital guaranteed back unless the issuer of the bond defaults on its debt. However, make sure you know how to value bonds and don't buy when the bond is overvalued. Know the difference between corporate and government bonds. These are funds that you can invest in which are actively managed by a professional fund manager. This comes at a fee as most fund houses charge relatively high sales charges and even platform fees. When you buy a stock, you're a shareholder of the company which means you're actually one of the owners in that company now. Buying stocks requires knowledge and monitoring of the market. Most people with a full time job will still be able to invest in stocks. Investors do not have to monitor the market all the time as compared to traders. Most investors buy stocks when they are undervalued or they buy for its dividends which provides a stream of passive income. Investing in stocks requires you to know how to interpret financial statements and also know the value of the company relative to the stock price. Investing in stocks sometimes requires patience to wait for the stock price to rise relative to its value. 5) If you love risk and want things to be fast, you can be a trader. A trader can trade in the foreign exchange market, the stock market and the commodities market. They can also use derivative products like options, futures or CFDs. Trading requires you to monitor the market all the time and in essence, it is a full time job. Most people who already have a full time job cannot be a trader. Do note that trading is a very hard profession and very few people succeed in it. It requires you to control your emotions. It is more of a psychological game. I started out learning how to trade and traded a few times. With a full time job, it is almost impossible to trade. Now i only trade once in awhile when there is a clear opportunity. Otherwise, my investment approach is more of finding undervalued stocks to invest in. This suits my style and my personality. I would rather take control of my own investment as i like and have an interest for investing. It has become part of my life now. As we can see, there are many investment products suited for different styles. It is up to you on which ones you want to choose. As a rule of thumb, always invest for returns higher than or equal to the inflation rate. The purpose of investing is to grow your wealth. You do not want inflation to devalue the cash you have over time. If your investment return is lower than the inflation rate, your investment is actually worthless. Read the news in the morning and this new product jointly launched by SGX and POSB caught my attention. I have just blogged about investing in ETFs and now there is a new product in the market. Have just checked from POSB website and I will summarise on the characteristics of this new product. This POSB invest saver lets you invest in an index ETF from as low as $100/month. The index ETF used is the NIkko AM Singapore STI Exchange Traded Fund. This ETF tracks the Singapore Straits Times index similiar to SPDR STI ETF. In my previous post on "investing basics - Low cost index fund investing (passive investing)", I wrote about investing in SPDR STI ETF using philip securities share builder plan. You can read about it and compare against this POSB product. Sales charge is fixed at 1% per transaction. If you invest $100, sales charge is $1. 4) Easy to apply through ATM machine or online at POSB website. No brokers involved and no complicated forms to fill. This product is beneficial to those who want to invest but do not have the capital or knowledge to do so. A return of 2-3% is better than putting it in the bank and the best thing is you can withdraw your money anytime. It is stated that no fees will be incurred when you sell your unit. This is subjected to change as indicated on POSB website. However in any investment, there are still risks involved. The returns are not guaranteed and you may still lose money in the short run. In the long run, investments generally return profits. 2. Investing Basics - How do I start investing? The following post is contributed by imoney.sg. I'm glad to be able to work with them to reach out to more readers on subjects related to financial planning and investments. You may have seen previous posts on housing loans which was also contributed by them. Some of my blog posts on SG young investment has also been featured on imoney site. Personal loans have become very popular and common in Singapore in the last decade. But what exactly is a personal loan and how does it work? A personal loan is an unsecured loan that is meant for personal usage – this means the bank won’t ask any explanation on what you are using the money for. As these loans are unsecured (meaning the bank does not ask for collateral) the interest rates will usually be higher than those on secured loans (car loans, mortgages, etc.). Another characteristic of personal loans is that they are short term, usually somewhere between 1 and 5 years, which means they are repaid much quicker than a mortgage, for example. The question that naturally comes next is: if there is no collateral, what are the other criteria that banks look at to determine the loan amount? In Singapore, the banks look at your monthly income and usually determine the amount you can borrow as a multiple of that number. For example, if you earn S$5,000 per month and the bank offers up to 5x you income, you are eligible to borrow up to S$25,000. 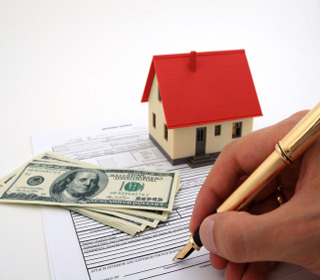 What about the costs associated with the loan? In addition to the interest rate, the banks usually charge an annual fee, somewhere between S$50 and S$90. Adding the two costs together will show what the total expense associated with a particular loan package is. While it might be tempting to take a personal loan to buy a new TV or take a nice holiday, for example, you should really consider whether it is worth doing so. The interest rates on personal loans in Singapore are high (between 9% and 18%) so you will most probably end up greatly overpaying that TV or holiday and regretting it later on. Personal loans are thus not the best way to finance such “entertainment” expenditures. So when is taking a personal loan a good idea? There are a few occasions where a personal loan can actually help you reduce costs. One of those occasions is called debt consolidation. Debt consolidation simply means taking a personal loan in order to merge more of your outstanding loans into one, usually at a lowest interest rate. Another occasion where you might want to consider a personal loan is to cover a large credit card debt. As credit cards have incredibly high interest rates it makes sense to repay that debt with a loan that provides lower ones in order to save money. Ultimately it makes sense to take a personal loan for things that will help you generate more income or create savings in the future. In addition to the two reasons mentioned above, other appropriate situations might be acquiring a professional education or investing in an asset that is quickly appreciating in value. If you think you are in need of a personal loan, be sure to compare the personal loans that are on offer by banks in Singapore! I've heard of this term called passive investing and think that it is suitable for those who are starting out in investing or those with little knowledge on investment. In essence, this method works by you putting a fixed amount into an index fund and let the fund grow over time. A recommended fund if you're investing in Singapore is the STI ETF. You can buy this ETF from SGX directly. However, currently the minimum investment for this ETF is $3000+. Most young investors who just started working will find it hard to invest $3000+ at a time. They will not have enough money to see the effects of dollar cost averaging which is investing on a regular basis. The solution is to start a share builders plan from phillip securities. I've attended talks on this share builders plan and have also talked to a licensed broker from philip securities to understand on how this plan works. Do note that an ETF is a listed as a specified investment product(SIP) and MAS requires all individuals to have certain knowledge before you can invest in SIP. If you do not have finance background, you can take a knowledge assessment by SGX and once you pass the requirements, you can start investing in it. The minimum sum to invest in is $200 every month. You can decide on a variety of counters to invest in. This includes blue chips like Capitaland, Capitamall Trust, DBS, Keppel Corp, OCBC, NOL, SIA, SGX, Singtel, SPH, ST Engineering, UOB etc. And not forgetting the STI ETF too. You can choose to invest in one counter only of you can invest in two or more counters. You can decide to allocate $200 every month to STI ETF and $100 every month to DBS. Total invested amount will be $300 per month in 2 different counters. The charges are simple to understand. Fees of $6.42 if you invest less than $1000 per month in <=2 counters. Fees of $10.70 or 0.2%(whichever is higher) if you invest more than $1000 per month in more than 2 counters. So for example if you invest $200 per month in STI ETF, the fee will be fixed at $6.42 every month. A point to note is that if you just invest $200 per month, the fees/charges is already 3.21% which is not recommended. When investing, i always try to keep my fees as low as possible, best to be less than 1%. This is because fees can reduce your investment significantly overtime if kept at a high %. 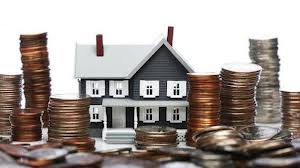 Therefore, the optimal investment amount should be more than $600 per month. This amounts to a fee of 1% which is manageable. Or the question should be why invest in an index fund? The reason is an index fund offers a good diversification of stocks in that fund itself. For example, the STI, which is the straits times index, comprises of the 30 largest companies listed in the Singapore stock market. If you invest in an index fund, you do not have to pick stocks individually. The best thing is component stocks in an index is changed periodically. Bad companies are removed and replaced with another company. Index all over the world has been rising for the past 50 years. An exceptional case is Japan which has seen its Nikkei index fallen in the past 10 years. Japan has been in a deflationary economy which is a reason for its sluggish economy and stock market. Elsewhere in the world, we're still seeing growth in the past 10 years. So how has the STI ETF performed over the past 10 years. From its fund factsheet, STI ETF has returned an annualized return of 8.04%. This is the return compounded over 10 years. Which means your money invested at the start has already doubled in the 10 years. STI does give dividends also. Adding the dividends, annualized return is about 11.31%. With performance like this, i'm sure this index funds has beaten most of the other funds out there in the market. You just have to invest monthly and let it compound over 10 years. No stock picking involved and no market timing needed. This is dollar cost averaging working in its power. The stock market goes through cycles. There are ups and downs but overall the stock market rises in the long run. This coincides with the economy of the country. Unless we have a situation where a country like Japan goes through a deflationary cycle for a long time, then the stock market will not rise. Passive investing is suitable for people who want to invest but do not know how to pick stocks. If you know how to pick stocks, your investment returns can be much higher. There are many ways to invest. You can be a value investor where you buy great companies at undervalued prices or you can be a passive investor where you invest regularly in an index fund. Its up to us to decide which one we want to be and to measure our own risk appetite. Start investing today to maximize the value of your money. Update: POSB and OCBC each came up with their own version similar to the Philip share builders plan which also allows you to invest in index funds. Check out the POSB invest saver and OCBC blue chip investment plan. Make sure when choosing on what to invest, select the correct one. Married with kids still can be rich? There has been quite a number of discussion on the question whether is it possible to be rich in Singapore if you're married? Many people say that housing prices in Singapore is very high, a wedding is very costly and the cost of living in Singapore is constantly rising. So is it possible to be rich and retire a millionaire even when you're married with let's say 2 kids? In 2007/08, the Singapore department of statistics conducted a household expenditure survey to gauge on the average expenses per household. I took 4 room HDB and household with 4 members because this is where most people are. Married with a 4 room flat and 2 kids. Of course this data is taken from 2007/08 which is some time ago. The department of statistics is doing another round of survey this year and is still ongoing currently. I expect the average monthly expenses to go up. Most of the household expenses are spent on paying the housing loan. For a couple who bought a 350k BTO 4 room flat, the loan that they take up would be 315k after paying the 10% down payment. If they take a 30 year loan with HDB at the current interest rates, the monthly repayment is $1262. If both the husband and wife earn a combined income of $6000, after deducting the expenses of $3057 (for household living in 4 room HDB), they will be left with around $2943. This adds up to an annual savings of $35316. Is this savings a lot and can the couple accumulate a million dollars. I do not think the couple in the above scenario will be able to. This means a family income of $6000 is just enough to live by. The practical aspects of starting a family begins with prudent financial planning. If not, many people will be stuck in the rat race and live day to day till their old age. Already older Singaporeans are finding it hard to retire and most still have to work. With rising cost of living and higher inflation rate, the need for investment becomes even more important. Savings alone will not bring us anywhere in times like this when interest rates in banks are minimal. We need to know how to maximize the value of our savings. It is possible to be rich even if you're married with kids. There are people who have done it. We should learn from people who have been through that journey. It was reported in channel news asia today that the shipping market is showing signs of recovery. However, China's economy is still showing signs of slow growth therefore the recovery should be more gradual instead of a sharp recovery. The Baltic Dry index is an indicator of the state of the shipping industry. It is also known as the "Dry Bulk Index". The index has jumped 68% during the first half of the year. This will benefit dry bulk shippers as they see an increase rate for each trip. Saw this news on the straits times. Looks like this company is expanding. Building a new HQ with its central kitchen and R&D centres under one roof just like breadtalk. "Select Group has accepted an offer of direct land allocation from Jurong Town Corporation of a piece of vacant leasehold site of about 64,434 square feet at Senoko South Road. The company said it would need more space to accommodate its increased production capacity, logistic and office support functions, in anticipation of future business expansion. Select intends to build a multi-storey building on the site, which will house its central kitchen facility, together with a research and development centre, training test kitchens, storage facilities, cold room facilities and the company's operations and corporate headquarters. The cost of construction will be financed through internal resources and bank borrowings." Has Singapore achieved the Swiss standard of living? 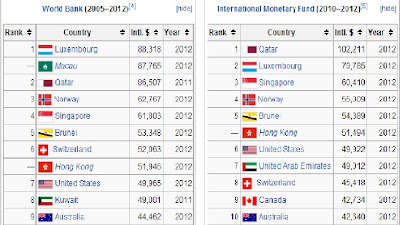 Singapore is ranked 4th in the world by GDP per capita surpassing the United States, Hong Kong and even Switzerland. Does this mean our standard of living is higher than the people in Switzerland and Hong Kong? GDP per capita is calculated by the value of all final goods and services produced within a country in a given year , divided by the average (or mid year) population for the same year. 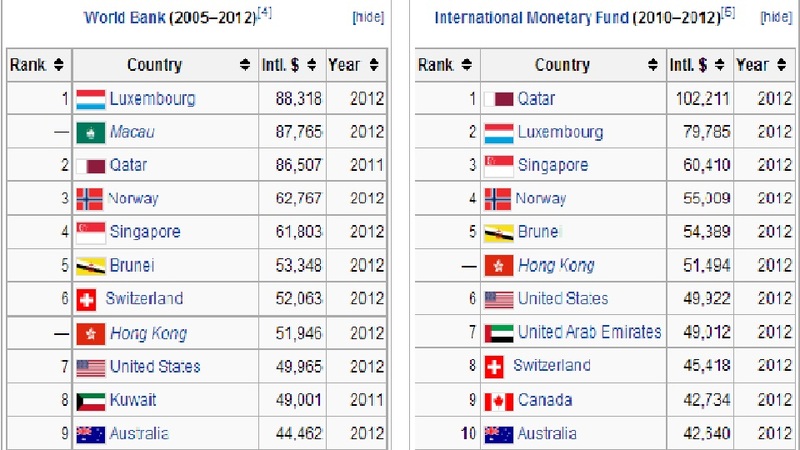 The world bank ranks Singapore as the 4th and the IMF ranks Singapore as the 3rd. The Singapore government once said that they strive to achieve the Swiss standard of living for Singapore. It does look like we have surpassed Switzerland currently. However, with such a high GDP per capita, are Singaporeans enjoying the results of this success? Have the hard work of previous generations benefited the current generations in Singapore? Truthfully, our lives in Singapore is much better than in the past. We enjoy the clean environment, a safe place to live and the convenience to travel around. Singapore as a nation has also become very wealthy and in fact the rich are getting richer. This shows that the rich are getting richer and the poor stays poor or even poorer in Singapore. As the cost of living rises, the poor have even a harder time to adapt to the rising cost of living. There are people earning less than S$800/month in Singapore. We are no doubt already a developed country. Should we be relaxing like the rest of the developed countries like Switzerland and Norway and enjoy the fruits of our success? If you go to Switzerland, their city is not so crowded and the pace of life is much slower as compared to Singapore. Even in developed countries like Australia, they enjoy retirement and welfare benefits and they have short working hours. Most of the shopping centres close by evening 5pm in Australia. In my economics class this week, we discussed on this issue. One reason Singaporeans still need to work harder is because of our small population and a lot of workers need to play multiple roles in their jobs, also known as multi task. One way to solve this problem of labour shortage is to increase productivity. Switzerland population is small at about 7.4 million currently. Singapore has a population of 5.3 million. But Switzerland's productivity is much higher than Singapore. Singapore's productivity has been declining according to the ministry of manpower. This is a concern for the government and they are increasing efforts to increase the productivity level in Singapore. If productivity increases in Singapore, we should see shorter working hours but still producing the same amount of output or even more. This will enable Singaporeans to have a better work life balance. With productivity at a negative now, Singaporeans are working longer hours and doing more work but not producing much to sustain our economic growth. Now, this may be the reason why they can have a slower pace of life, shorter working hours but still a growing economy. Switzerland's productivity level is even higher than Australia at more than 107. We are no doubt ranked higher than Switzerland in terms of GDP per capita but our productivity levels is still far from those of a developed nation. I do think that Singapore is on the right track of training workers to have better skills and increasing productivity. We cannot belittle the negative effects of slower economic growth. It does affect the country and also individuals living in it. Look at the situation in Europe especially Greece, Portugal, Spain and you will know. If we want to have a better work life balance but still strong economic growth, working lesser but producing more is the key. Technology plays a big part in this. We should increase our skills, learn new technology to enable us to be more productive. Singapore has no natural resources and a big portion of our economy is generated through the services sector. Financial services is important to a country like Singapore as a lot of money is invested in Singapore. Increasing our financial knowledge and learning how to manage and compound our money makes the economy grow as cash flows through the economy. In finance classes, we learn that a good financial system is vital for businesses to grow in a country as funds can be raised through the bond and stock markets and liquidity can constantly flow in the economy. We can help to increase the financial literacy in Singapore that many people can benefit from good money management habits. 3) why singaporeans have to retire later as retirement age is constantly increasing. All these are big topics and it has been debated for the past few years in our homeland, singapore. So what has this got to do with our analysis of companies to invest? I think as our economy becomes more competitive and we face a shortage of manpower due to ageing population, companies need to restructure the way they do their business in order to stay competitive. The restriction on foreign workers has impacted businesses in singapore already especially in the f&b sector, the services sector and construction sector etc. Why is the government imposing a higher levy on each foreign worker hired? Won't this increase the cost of the company and result in lower profits? Yes, it will impact firms greatly especially those that rely heavily on cheap workers. The purpose of this policy is to increase the productivity of firms especially SMEs. In a way, it forces the company to use technology and rely less on workers. If you study economics, you'll know that for a developed country like singapore, we cannot increase economic growth substantially by increasing capital or labour as developed countries faced a phenomenon called diminishing rate of returns. Developed countries need to grow by increasing technological change which improves productivity. That is the direction that the singapore government hopes to steer the country into. Technological growth is costly. Firms who can outgrow competitors are mostly those who invest in research and development (R&D). If you look at most of the successful firms in the world, you'll realise that most of them invest greatly in R&D. Google and samsung are such examples. The amount they invest in R&D is enormous. How about firms in Singapore? Food and beverage firms face higher manpower cost due to tighter foreign labour policies. Breadtalk for example has invested in a new office building which they just moved into. Their central kitchen is located there together with their offices and they have a fully automated production line for their bakery in that building too. This helps to save cost for them greatly. The new building also house their R&D department which they are focusing a lot into it. On the other hand, if a company does not constantly innovate and change the way it does its business, it may lose out to its competitors and even big market leaders like Nokia which was considered a giant in the telecom industry, is facing huge losses year after year. We can have many ways of analysing a company and I think one important factor to look at is how much the company is investing in R&D. This will help the company to continue growing and have a sustainable business model. Saw a fellow blogger AK71's post titled "have money also must have heart". This reminded me of a video I saw on youtibe showing the difference between how the rich and poor live their lives. In the midst of striving to be rich, let's not forget to have a heart for the poor. Interest rates are starting to rise and it affects the amount of loan that you pay for your housing mortgages. But how much will it affect you? Inforgraphics provided by imoney.sg , a price comparison website dedicated to helping Singaporeans make the best use of your money. 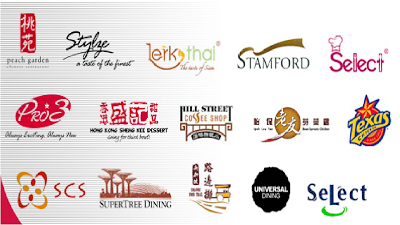 Select group is a leading food service provider in Singapore. They started out with catering as their main business and branching out over the years to include restaurants, fast food chains, desert chains, F&B management services, event catering etc. This company caught my attention as their financials reflect positively on their management capabilities. Some of their brands are quite successful and i'll describe my experiences of what i think of them. Firstly, Texas Chicken is a well known brand in Singapore now. When they first started out, i was sceptical that they could survive with KFC and Popeyes already in Singapore. Later on, i've been hearing my colleagues, friends and relatives talk about texas chicken. The comments were good and most of them were saying texas chicken sells better chicken than KFC. It was then i decided to try it out and it was unbelievable. Their chicken were different from KFC indeed. More juicy inside and even their breast meat was not so dry. Even my foreigner friends were commenting positively on Texas chicken too. Indeed if you look into their financials, Texas chicken has seen an increase in revenue from 8.131 Million in 2011 to 11.094 Million in 2012. Secondly, they have Stamford as their catering business. This caterer name i've seen a few times before and i realised my company has been engaging their services for many of our events. I remembered during my army days, SAF also engages Stamford catering. With big institutions as their clients, their business is relatively stable. Thirdly, they have this restaurant called Peach Garden. This is the restaurant that contributes most to their revenues. Peach Garden made up 30% of their revenue in 2012. I've not been to this restaurant before but have heard people saying about it. They specialise in Chinese fine dining. Now moving on to their financials. Revenue and Income has been increasing consistently for the past 4 years. Their balance sheet is healthy with strong cash and low debt. Cash flow has been increasing consistently also. If you look at some of the financial ratios, it is quite promising for the company. Dividend yield is fairly attractive at 6.41% at the current price of 0.39. I have bought some shares of this company as of this week. I think their management have been actively expanding the business and it is good for the group. They are also planning to introduce two new culinary offers this year and expand each of their businesses to 20 or more outlets. Its share price has risen from 0.35 to the highest of 0.40 and closing at 0.39 today. This is about 10% increase this week. *All financial information adapted from investing.businessweek.com and Select group annual report 2012. *Picture adapted from Select Group corporate website. Today I managed to have the cheapest nasi briyani I've ever had in my life. A plate of nasi briyani with one curry chicken drumstick, egg and vegetable cost only $1.90!!! Nasi briyani easily cost more than $5 elsewhere. If youre thinking where to get it, you'll be disappointed coz its only available in school's canteen. Just lucky today I was doing some work at a secondary school in Singapore so got a chance to eat cheap food. This make me believe that high and increasing food stall rental is the cause of our more expensive food prices here locally. School food stalls mostly have minimal or zero rental charges thus they can survive selling at cheap prices. Buying a house is a major decision in life. There are so many packages in the market from different banks offering different interest rates mortgages. Which one should you choose? They also offer comparisons of saving deposits interest rates, time deposit rates, credit cards information and much more. Banks in their list include DBS, POSB, OCBC, HSBC, OUB, Citibank, standard chartered bank, RHB, ANZ, Hong Leong, Maybank, CIMB, Bank Of China. You can see thier service is quite comprehensive and best of all its free to use. There are articles there for your reading pleasure too. I've posted a new page to list down my goals. You can click on the "my goals" tab at the top of this blog to view it if you're interested. It's always a dream to achieve 1 million. I'm not a person who spends a lot and i live a simple life. Why do i need 1 million? The reason is with 1 million, i can invest it and create a modest passive income stream to reach financial freedom. Another reason is investing 1 million to become 2 million is a 100% return. Thus, to create the next million will take me lesser time maybe 5 years if i see the next bear market. 10k to 20k is 100%. 1 million to 2 million is also 100%. This is the reason why the rich get richer. I've always been taught not to go after money and material things because money will not make you happy. This i agree with it and thus i think achieving 1 million is not about going after money or material things but seeking for a financially free life. I've seen people complain about their jobs, complain that they don't like their bosses and also complain that they still have to work at a old age and cannot retire. If i do not want to be like that when i'm older, then i should plan for my life now. I believe that only by achieving financial freedom can we then truly live a life not being a slave of money or getting caught in the rat race. It is then can we truly enjoy life in itself. This does not mean i will stop working when i achieve financial freedom but rather i have a choice to do the things i love.